The Eurozone has always struggled with lack of cohesion among its leaders. But any semblance of coordination that existed last year may now be breaking down. There is significant risk that Germany and France will no longer be able to reach joint strategic decisions (such as the one described here) as they did in the past. As discussed back in January, Hollande's potential victory posed a risk to the Franco-German leadership in the euro area. Now that Hollande has won the election, signs of discord are becoming apparent. WSJ: - After the new French president lashed out at Ms. Merkel's austerity policies during his election campaign, their first meeting commenced with a handshake rather than the pecks on the checks she traded with Mr. Sarkozy. And while Berlin has sought to play down the perceived rift with Paris, Mr. Hollande's decision to lower the legal retirement age for some workers put France back on collision course. Of course other than Germany, the Eurozone nations' economies have deteriorated (including France). Italy is in deep recession, and Spain is living from auction to auction (the nation has to sell 2, 3, and 5-year government notes tomorrow). The Eurozone's economic landscape has changed considerably since the beginning of the year. And the disparity is adding to charged political frictions within the area. WSJ: - Not only the personalities have changed. Since France's credit was downgraded in January, Germany has been the only economy among the euro zone's big four still branded triple-A by all major rating agencies. That has put Ms. Merkel in a lonely position, painted not only as the chief architect of the currency union's crisis strategy, but at the helm of the country whose economic heft provides the main scaffolding still holding it up. 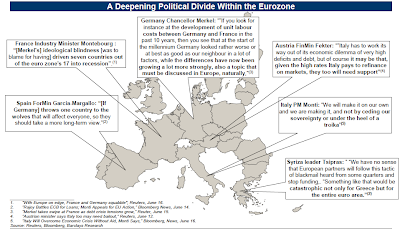 The widening divide in the Eurozone does not just involve Germany. This post for example describes the Italy - Spain high level political spat that took place recently. 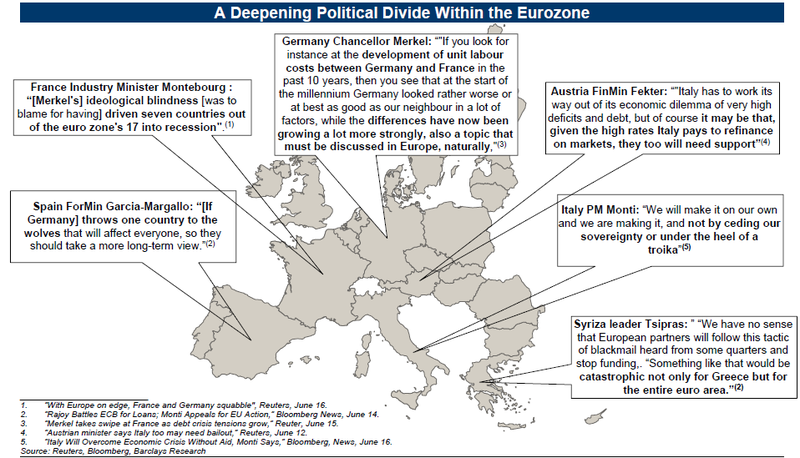 Barclays Capital has put together a collection of quotes from Eurozone's leaders that shows the intensifying disagreements and political pressures they are facing. This deepening political divide does not bode well for the Eurozone's ability to develop and fund the so-called "firewall" that would reduce the risks of Spain or Italy taking the Eurozone to the brink. That's why the recent lull we've had in the markets is likely to be short-lived, as hopes of much needed decisive solutions are quickly dashed.